Briefly fry onions and vegetables in spices. Briefly sauté sausages, almonds and raisins. 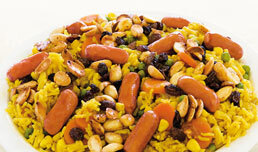 Serve in a dish and garnish with sausages, almonds and raisins. Copyright © Robert Damkjaer Ltd.
Robert Damkjaer Ltd. is a third generation family-owned company. We will be pleased to send you further information about the Robert products.